Used Pallet Rack Buy and sell. Rack Repair, wire decks, conveyors, mezzanines and modular offices. Vistage – CEO peer group. A leading business advisory and executive coaching organization. WERC -Warehousing Education and Research Center. An association for logistics and warehousing professionals. 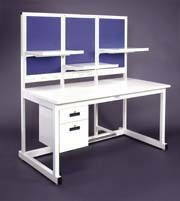 RCMH will custom design the perfect work station to meet your specific needs. We can accommodate virtually any job requirement with efficient custom-made benches. With so many available options, like adjustable shelves and drawers, electrical strips, hydraulic height adjustment, air distribution, trolleys & balancers and CPU holders, your custom designed work station will meet your requirement.